Discover the great city of Carcassonne, one tile at a time! The streets of Carcassonne are filled with kids who are trying to catch the animals set loose for the festival. The city has never been so alive! 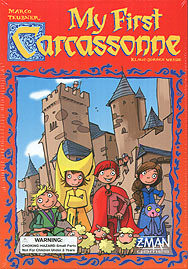 This version of the modern classic, Carcassonne, has been adapted to allow players of all ages to play together. No need to count points! Each turn, you place a tile to build Carcassonne. When you close a street with one or more kids of your color, you get to put your pawns on the board. Be the first to place all of your pawns to win the game!